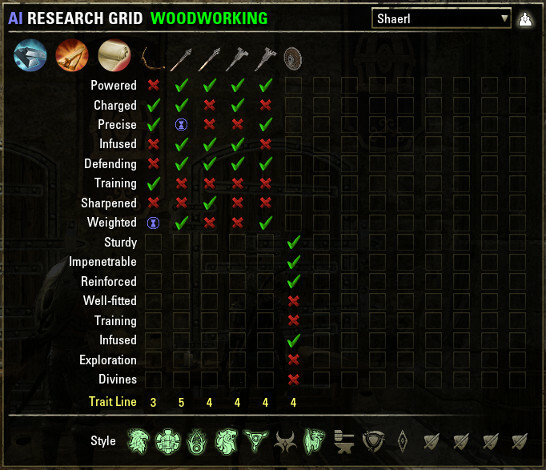 AI Research Grid allows you to quickly and easily see which traits you have researched for Blacksmithing, Clothing & Woodworking, wherever you are in the world. Now has support for viewing multiple characters on the same account! Shows which motifs/styles you have learned on each character. When the addon main window appears, you will see icons at the top-right of the window, representing Blacksmithing, Clothing & Woodworking. You can hover over the icon of an item type if you're not sure what it is (daggers & swords look kinda similar). So, several hours later, this addon was born. Could you possibly include a tooltip function so when you mouse over an item in an inventory (personal, bank, and guild bank) it will tell you if the trait on that item has been discovered by the current char or an alt yet? or would that have to be in a completely separate add-on?